Footwear is crucial to climbing innovation and every bit as closely linked to the progress of the sport as technical hardware. Prior to the advent of Vibram soles in the post Second World War era, boots were normally nailed, a practice which dated back to Roman times. Very often the nails were used to protect the expensive leather and give the footwear longer life. This same principle was used when ‘irons’ shaped like horseshoes were fitted to wooden clogs in many areas of northern England until the 1950s. Climbers began at a very early period to customise the patterns of their nails. John Ball, the first president of the Alpine Club, is the first recorded climber (Sept 1857) who modified his nails, “stopping for half an hour to screw in his points” whilst en route to the summit of Monte Pelmo in the Dolomites. Félix Genecand, a jeweller by profession and passionate climber based in Geneva, Switzerland, designed a new type of boot nail and nailing system in 1912. It was a performance breakthrough which came because he was able to harden nails for the first time by making them in 2 pieces. The hard gripping part was brazed to the softer malleable part which was attached to the boot by a transverse double nail. The hardened steel nails were aligned with the periphery of the toe of the boot, so giving the boot and the climber the ability to grip a much smaller hold, even to a small pebble. Additionally the nails could be fitted without the specialist help of a cobbler and ensured greater length of life. The name he gave to these nails was the affectionate nickname given to him personally by his climbing friends, “Tricouni” after the climb of the same name in the Salève near Geneva. Nailed boots were very effective on wet, lichenous or ice covered rock and were perfect on nevée slopes and good in ice steps. For many alpine climbs of the day, crampons were unnecessary. 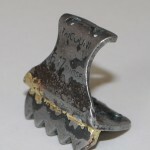 It is possible that this very effectiveness, combined with the common practise of employing guides who did the step cutting, slowed down the progression of crampon development ( and the usage techniques which accompanied it) despite the design of the Eckenstein crampon in 1908 -12. There were two critical insulation issues however with this type of footwear. Firstly nails were perfect for conducting heat away from the feet and secondly crampon straps restricted circulation. Boots were much less structured internally in this period, allowing straps to compress the foot much more easily than today, another reason why climbers avoided crampons. It was customary practice for alpine climbers to select boots large enough to be used with two pairs of socks. For Himalayan climbing the sizing was increased to allow three pairs of socks. However, simply adding more pairs of socks could not solve the problem and there were many attempts to improve boot design. The British 1924 Everest expeditions used nailed boots and improved insulation by using a felt boot with thick felt mid-sole which had the nails pre-fitted to the leather, thus reducing the amount of heat loss. These pictures are of the boot (recovered from Mallory’s body in 1999) which is in possession of the Royal Geographical Society in London. Our research shows that Mallory and Irvine’s clothing was 40% lighter below the knee than climbers’ clothing is today, blowing away many myths on this subject. This was because of the very light felt boots and not using crampons. Tricouni heels were a full heel plate to which nails were attached by screws. The whole plate was attached to the boot by hammering the side spikes in onto the boot sides and the screws had points which helped avoid rotation of the whole. 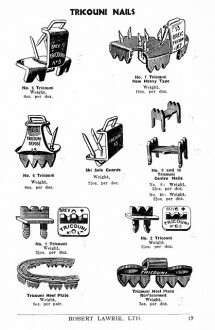 It was a common practise to combine Tricounis with Vibram soles in the early post war period and indeed the Tricouni company had a non Vibram rubber/nail combination. As is so often the case with mountaineering products, this was lead user innovation but by a person who had the skills and know-how (because he was a jeweller) to develop this into a significant ‘process innovation’. Other nails were always single piece metal and the process innovation here was to combine a softer part with a hardened part, for extra performance but to do so on a high volume commercial scale. At the height of his success the company was producing millions of nails per year for the Swiss and French armies. Our full story of Felix and his company is still being researched. We discovered to our surprise that Tricounis ares still being produced for loggers and similar activities in NW USA/Canada and New Zealand. We learnt to climb in Tricounis. In 1951 nailed boots were the standard mountain footwear and when, aged 14, my mother took me to Robert Lawrie’s establishment on Seymour Street to be fitted with my first mountain boots, I had already been briefed to specify Tricounis around the sole, clinkers round the heel and star muggers on the flat of both. We soon learnt precision foot placing. If your ankle could hold – and good boots helped – you could actually stand on an individual crystal. Tiny incuts and flakes, often in those days not yet too badly polished, were the key to many moves for there was no friction, as we now know it, except on flat ledges. On thin pitches every move had to be precise and delicate and you sort-of carefully tiptoed your way in balance up the rock. Really hard routes – in those days as young teenagers VS was considered pretty hard – friction was usually required, and like more experienced climbers we would wear tennis shoes. The very thin and skimpy Woolworth’s plimsolls or ‘daps’ were best but not as good for scrambling down to the foot of the climb again as were the more substantial Dunlop Green Flash tennis shoes. On damp rock we’d pull socks over our daps or even experiment with scarpetti – Italian rope-soled climbing slippers that Lawrie imported. Boots, ‘sacs and sandwiches could be left openly at the foot of the crag, no one would dream of stealing gear in those days.The actual nailing pattern was a matter of personal choice and much debate. Some climbers preferred tricouni heel plates or mixed clinkers and ‘trikes’ around the sole. ‘Trikes’ were hard steel and serrated and said to be excellent on limestone but in our teens we climbed only in Wales or Scotland. Clinkers were soft, chunky nails and although less precise were preferred by some for use on hard rock and were probably also more comfortable walking on rocky ground. Occasionally we came across ‘Tricouni-Mixte’ soles with ‘trikes‘ round the edge of a ridged rubber sole, which were supposed to be more comfortable on rocky paths. I wore tricounis on my first two alpine seasons, crampons came later with my first vibrams. Tricouni-nailed boots were hot and certainly uncomfortable, even painful, on hard alpine paths, but once ‘off-road’ proved to be excellent, general purpose all-terrain alpine footwear, safe – if cold – on hard snow and glacier ice and of course, perfectly familiar on rock..
Nails took slime, lichen, wet rock, moss, seaweed and verglas in their stride and indeed held their own in Scotland for some years. Aberdonians were known to favour them well into the sixties while they were de rigeur in the Royal Marines Cliff Assault Wing until the clatter of nails on rock was considered to give the game away during surreptitious landings.